I am back with my weekly updates on the Diet program. I know I haven’t been very strict with the diet the whole of last week. Well I had lot of excuses. With Athamma not being in town and no help with the household work, I was stressed beyond words. I needed energy to just move about or so I said to myself! This forced me to eat the regular food that was cooked. Anyway I tried compensating at least one meal. Tough times won’t last long, so here I am in a much better situation, being able to manage things to an extent. In fact I have gone back to my diet regime. The major dish that helped me in this aspect was the Goduma Dosa, when rolling out or even cooking those rotis sounded tough, these quick doses came as a big help. 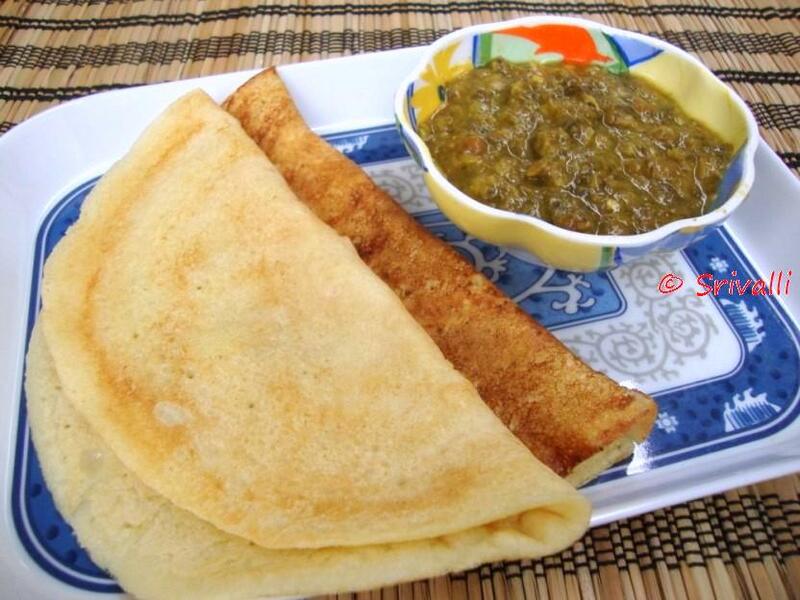 If plain goduma dosa bores you, then spice it up by mixing in Green chili paste, or add vegetables or even onions would really help. When you are on diet there is no need to eat boring stuffs right. 4. Goduma Uthapam with Onions. Similarly you can make Dosas or Adais with Channa Dal/ Bengal Gram dal. Spilt Yellow Moong Dal. The famous Andhra Pesarattu is made with Whole Moong Dal. When we don’t add the rice flour, the dosas/ pesarattus comes out soft. But as a replacement for nutrition, it is really good. With the Vada Pappu I offered as prasadam on Sri Rama Navami, I didn’t want to make the salad with the whole lot. Instead ground it to make dosas for the lunch. Wash and soak yellow moong dal for 30 – 40 mins. Drain and grind to a smooth paste. Add salt. Heat a tawa and grease with oil. 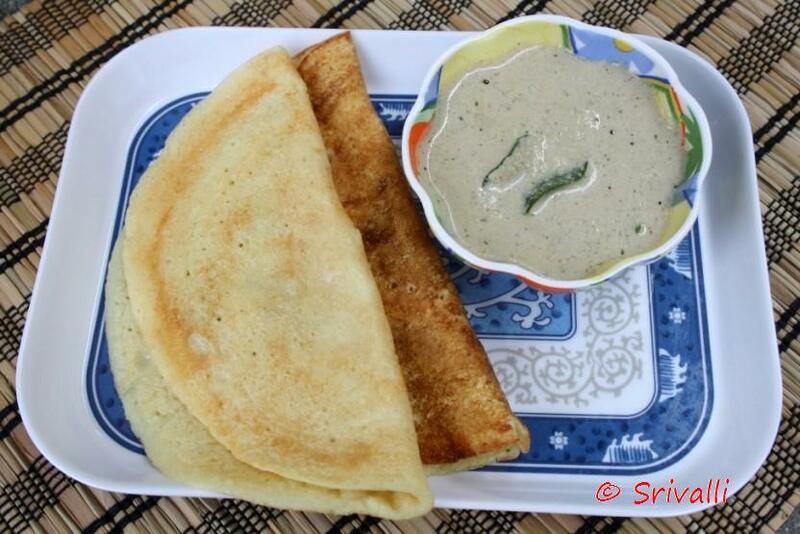 Pour one ladleful of batter and spread as you would a regular dosa. Sprinkle the cumin seeds, Onions and ginger if you are using on the top. Sprinkle little oil. Cook on medium flame to ensure it gets cooked well. Then flip to the other side and cook again. With one cup, you would get about 4 medium sized dosas. Serve with Chutney or Dal. Well I clicked a photo with groundnut chutney. But since I should not eat, I again took it with the Gongura Dal that I took for Lunch. I wouldn’t say these were the best of combos, but then it was one healthy lunch. You can serve this with Sambar or other regular Dals. How is everybody’s diet going on? hey love this yellow moong dal version of pesarattu..will be trying soon..looks so crispy..
Wow, soaking only for 40 minutes,what a jiffy. Will try once. Srivalli, yummy looking. In the first picture, you have chutney with dosa. Can you please post that recipe as well as it looks great or let me know if you already have a post for that. this was exactly wat i wanted…a dosa without a carb flours like rice/wheat…thanx a lot…bookmarking this one!!! Havent tried pesarattu with split moong dal. Looks lovely VAlli. The pesarattu looks yummy . Must give it a try !! Thank you friends..I am so glad this was liked! Healthy diet for lunch is a great idea and as I'm finding here in Arizona its becoming more popular. I have started an Executive lunch program as well as I'm working with local fitness trainers to prepare breakfast, lunch, and dinner and snacks for their clients at bootcamps. I must keep each persons calorie intake under 1500 per day as well as make the meals tasty and filling. Its a challenge at times, but I have come up with many recipes that fill those needs. the client also gets to go home with a recipe book of the weeks meals to help them continue on the path to healthy eating. Many times executives don't have the time to eat a healthy lunch so I prepare their lunch and deliver it each day to them. They choose the menu and I prepare it. this has become very popular for physicians in the area. People in general are really starting to take to the idea that proper diet is the best medicine to prevent many illnesses and problems throughout life. This is an excellent alternative when you want to dish out a quick dosa within a limited time-frame. Healthy and nutritious and quick – what more can one want!